This article explains how to upgrade or downgrade your (mt) Media Temple server. The Grid only has only one plan level, and as a result cannot be upgraded or downgraded. 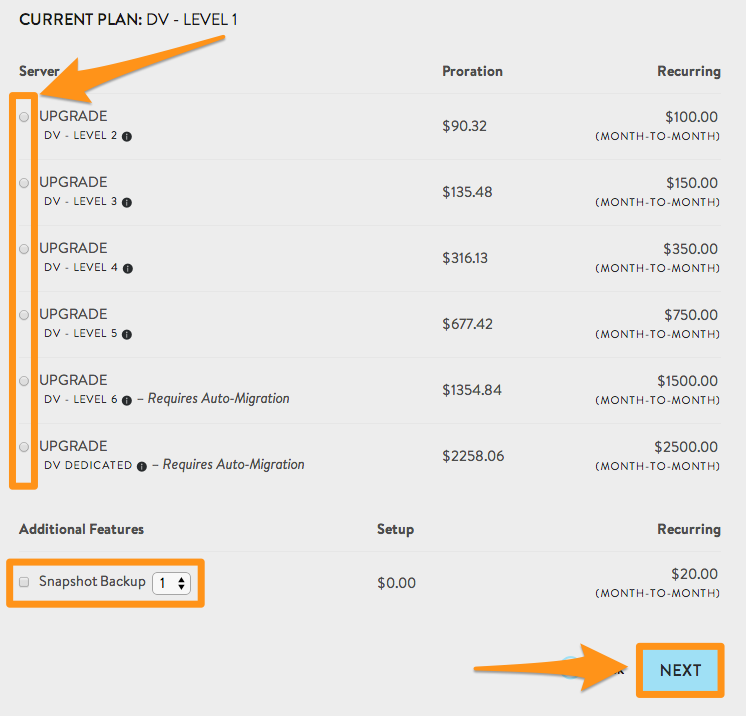 The "Upgrade Server" option will only appear if you are on the Grid Lite plan, which was only offered for a limited time. If you are on a Grid Lite, this option can be used to upgrade to a full Grid plan. 2. Select the Admin button next to the server you want to upgrade. 3. Click the Upgrade Server button under the Add-OnsServer Admin menu. 4. In the next menu, use the radio button at the left side to select the plan you wish to upgrade to, then click the Next button at the bottom of the screen. Any level featuring a "Requires Auto-Migration" warning will require special arrangements. You will be prompted with additional information before proceeding. Please read all information carefully before continuing. You can also use the "Snapshot Backup" option at the bottom to add additional Snapshot Backup slots! 5. If your selected level requires an auto-migration or change of IP, you will be presented with additional information and an option to schedule the time of your migration. In order to ensure a smooth migration, be sure to read and follow all steps shown, if any. 6. Finally, you will be prompted with a payment confirmation with a breakdown of all charges currently. Click Next to complete your order. If you need any assistance during the upgrade process or have any questions before you upgrade, please contact our friendly Sales department by phone at (310) 841-5500 or using the chat option in your Account Center. They will be happy to assist you with your upgrade.